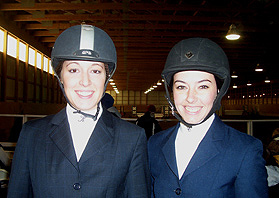 Seen here with teammate and open rider Paige Brady, freshman Emily Kowalczyk (on left) was the third of seven Cazenovia College riders to win a class at the October 25th, 2009 S.U.N.Y. - Geneseo show. Pittsford, NY - A day after losing the 2009-10 season opener to St. Lawrence by a slim 39-37 margin, Cazenovia College outscored the defending region champion Saints by a 43-29 margin to move into first place in the Zone 2, Region 2 hunter seat team standings through October 25th. However the real story of the day was the near-miss victory for S.U.N.Y. - Potsdam. The Bears scored 42 points to miss out by a single point, earning their reserve high point total with only six of the eight divisions filled on their point card. Janet Peachey, a junior from Rochester, New York who was the only Bear rider above the novice level to compete on the second day of back-to-backs at Lehman Farms, won her open fences (the second class of the day on what became a very long day) while later winning her intermediate flat. Alexa Basile, a freshman from East Setauket, New York (who trains with Stony Brook University Head Coach Myrna Treuting back home) won both of her novice classes. Both went on to compete in what was a four-way ride-off for high point. Michelle Robinson, a freshman from New Paltz, New York (whose 4-H leaders were S.U.N.Y. - New Paltz coaches Susan and Gary Clark) won her advanced walk-trot-canter. Megan Roser, a junior from Malone, New York, won the 39th and final class of the day at 6:28PM which was the fourth section of walk-trot. The Bears won exactly six classes for the day, with all six winners coincidentally the Potsdam point riders. Sophomore Allison Johnson also earned a top two placing with a second in her section of walk-trot. A check of the record books did not confirm if this is the all-time high score for S.U.N.Y. - Potsdam but in any event Head Coach Debbie Healey was overjoyed nonetheless. In total contrast Healey had seen her Bears score 13 points with a similar number of riders entered only 24 hours earlier. Not only did S.U.N.Y. - Potsdam Head Coach Debbie Healey (on left) see freshman Alexa Basile (on right) earn Reserve High Point Rider honors, she even saw her Potsdam team take home the Reserve ribbon. The Bears scored 42 points without an open flat or intermediate fences rider. While Potsdam was in a celebratory mood, Cazenovia College had just as much if not more to be happy about. The Wildcats gradually pulled ahead of rival St. Lawrence, eventually earning 43 points and High Point Team Honors. 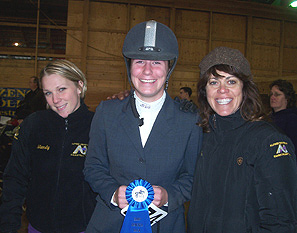 Kristen Williams (in open fences), Katie Wright (in open flat), Kristin Small (in intermediate fences), Emily Kowalczyk (same), Courtney Bruso (advanced walk-trot-canter), Brittnay Callahan (same) and Emily Haarz (same) won classes for the Wildcats while Paige Brady (intermediate flat), Kate Zimmerman (novice flat and fences), Small (novice flat), Sarah Gray (novice fences) and Sabrina Proctor (walk-trot) earned red ribbons. The Wildcats emerged from the weekend in first place overall, averaging exactly 40 points per show. And though Cazenovia won while Potsdam scored 42 in a spectacular way, S.U.N.Y. - Geneseo nearly caught both of them. The host Knights scored 41 points and even tied the Wildcats for most blue ribbons at today's show with seven each. Anna Kresge, a junior from Port Crane, New York won both her intermediate flat and novice fences to qualify for the ride-off. Also earning blue ribbons for Geneseo were Katie Roberts (in intermediate fences), Holly Schimpf (in novice flat), Casey Williamson (advanced walk-trot-canter), Erin Moran (beginner walk-trot-canter) and Caroline Patton (walk-trot). Though blue ribbons were not hard to come by for the Knights, senior and Team Captain Amyrose Lomele earned their only red ribbon with a second in novice fences. Geneseo had finished third yesterday as well, having scored 32 points. Through two shows the Knights were in second place, averaging 36.5 points per show in the early going. One school gave both St. Lawrence and Cazenovia a run for their money in the team standings each of the past two seasons before settling into third place, and that school is Alfred University. The Saxons were fourth at today's show with 35 points, earning four blue ribbons. Kalcy O'Keefe, a sophomore from Rochester, New York won her intermediate fences while Michelle Flannery, a junior from Syracuse, New York, won her novice fences three classes later. Kelly Reinbold, a sophomore from Ontario, New York won the fourth of six sections of novice flat while Zhenia Bemko, a junior from Cranford, New Jersey won the first of four sections of walk-trot. Saxon riders who earned red ribbons were Beth Ulbrecht (in open fences), Kate West (in intermediate fences), Barb Kozoil (in intermediate flat; are we spelling her last name correctly? - Editor), Danielle Ross (novice fences), Flannery (novice flat), Tesla Parker (same) and Jessica Repanes (advanced walk-trot-canter). On opening day Alfred scored 26 points while placing fourth overall while Ross took Reserve High Point Rider Honors. From Shortsville, New York, S.U.N.Y. - Geneseo sophomore Casey Williamson (on left) was one of six Knight riders to win a class on October 25th. Williamson was a winner in advanced walk-trot-canter. Williamson's Mother (on right) helped track the points for the host school inside the heated lounge in the corner of the Lehman Farms indoor. The Knights also came close to Caz, trailing only 43-41 when it was over. Just as Geneseo repeated third place and Alfred repeated fourth, the Syracuse Orange repeated fifth place two days in a row. And just like the Knights and the Saxons their point totals were way up on day two of the back-to-backs. Syracuse scored 33 points, eleven more than on the 24th. Kristen Unbehend, a senior from Cicero, New York won the first of three blue ribbons for the Orange by besting seven others in the third section of novice fences. Brianna Bach, a sophomore from Wyndham, New Hampshire won her novice flat while Stephanie Borowve, a sophomore who coincidentally is from Syracuse, New York, won the third of four sections of walk-trot. Kristen Freiburger (in open fences) and Charlotte Kramer (in open flat) won red ribbons for the Orange. Though St. Lawrence scored only 29 points the Saints did well individually. Abby Cook, a sophomore from Duxbury, Massachusetts (whose younger sister Haley is a freshman for the University of Mary Washington team in Zone 4, Region 1) had a perfect weekend. Cook was high point rider at Saturday's show, winning her open fences, her intermediate flat and the ride-off. At today's show Cook won the open fences class that started the day, then later won her debut in open flat. 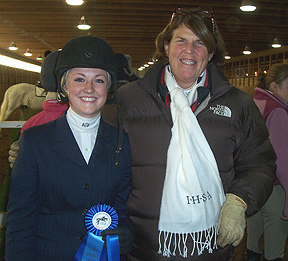 Hadley Deming, a junior from New York City (whose older sister Esther also rode for St. Lawrence) won the section of intermediate flat which followed Cook's open flat victory. Lily Dorris, a freshman from Wood's Hole, Massachusetts won her novice flat while Emma Jones, a freshman from Andover, New Hampshire won the section of novice flat immediately afterward. Suzanne Snyder was second in open flat while Michelle Dumas was a red ribbon winner in advanced walk-trot-canter. Chesney Randi, one of a very small number of riders added to the program the day of the show, was second in walk-trot. The Saints still came out of the weekend in third place overall, averaging 34 points a show. Four different schools scored 23 points, with Nazareth College emerging as the most consistant of the four by virtue of scoring 21 points during the opener. Kali Knickerbocker, a sophomore from Pittsford, New York earned the Golden Flyers' lone blue ribbon of the day by topping a field of seven in the third section of intermediate flat. Nazareth faired well in the red ribbon department, as Knickerbocker (in intermediate fences), Amber Streicher (advanced walk-trot-canter), Caley Fain (beginner walk-trot-canter) and Caitlin Malone (same) earned seconds. The Golden Flyers scored 23 without benefit of an open rider at today's show. Where can we get a scarf like the one Coach Dreuding has? St. Lawrence Head Coach Mary Dreuding (on right) poses with Abby Cook of the Saints following the latters' first in open flat. Cook was invincible over the weekend, earning four blue ribbons and winning ride-offs each day. S.U.N.Y. - Oswego entered the day with a clean slate, as the Lakers did not compete at yesterday's season opener. 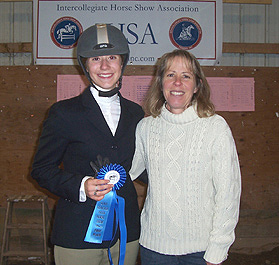 Therefore when Lauren Campagna won the final section of novice fences the sophomore from Webster, New York delivered Oswego's first hunter seat blue ribbon of the 2009-10 season. When she showed in intermediate flat later in the day Campagna also earned the Lakers' first red ribbon of the new season. Sophie Waitkins was second in the final section of novice flat while Katie Hartman was second in the third of six sections of advanced walk-trot-canter. Oswego scored their 23 points without benefit of a walk-trot or open fences rider. Ottawa University was one of three Canadian schools entered at today's show and the only one to break double digits. The GiGi's were lead by second year rider Emily Marcogliese. Coincidentally from Ottawa, Ontario, Marcogliese won her advanced walk-trot-canter. Jordan Fulcher was second to Peachey in open fences. The second place rider in the final class of the day was Jennifer Marcellus, who is listed in the roster page as an Ottawa rider but within the list of riders entered in class 1D Marcellus is listed as a Syracuse rider. Because her number back falls in line with other Ottawa riders rather than Syracuse riders we are guessing Marcellus rides for the GiGi's. Ottawa came out of the weekend averaging exactly 20 points per show, having earned 17 on the 24th. The fourth and final school mentioned to score 23 points at today's show accomplished this feat without earning any blue ribbons. However the University of Rochester was the only member of the '23 club' with a full point card. The Yellowjackets earned four red ribbons via Elisabeth Arthur (second to Roberts in intermediate fences), Katherine Groenevelt (second to Peachey in intermediate flat), Catherine Rose (second to Schimpf in novice flat) and Lindy Hyaden (second to Robinson in advanced walk-trot-canter). As was the norm for nearly all the teams entered, day two was higher scoring than day one, with Rochester following up a 19 score with 23. Four Alfred University riders won classes at the S.U.N.Y. - Geneseo show, including Kalcy O'Keefe (center) in intermediate fences. Saxons Head Coach Leigh Fischer (on right) and Assistant Coach Mandy Hermann (on left) saw Alfred score 35 points one day after scoring 26 in the Region 2 hunter seat season opener. Canisius College scored 12 points with four of eight divisions filled on their point card. Junior Cassidy Hogroewe was second in novice fences, the only Canisius undergraduate rider to compete in any of the first 16 classes held. 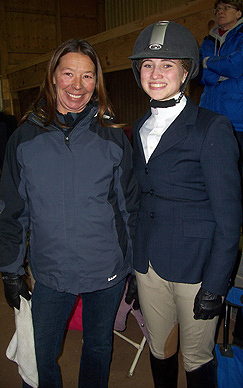 Carolyn Rudinsky, a junior from Western Springs, Illinois, won the first of two sections of beginner walk-trot-canter. While schools in some regions graple with the fact they have no walk-trot rider, Canisius has a monopoly here, with riders in each of the four walk-trot classes held at today's show. Rochester Institute of Technology was the last school to reach double digits. Freshman Alexandra Booth was second to Marcogliese in advanced walk-trot-canter for RIT's top ribbon. The Tigers finished with ten points. Both Canisius and RIT had scored 14 points a day earlier. Brock University had only three riders entered at today's show but still scored nine points. Rochelle Day earned Brock's best ribbon of the day with a third in intermediate fences. With the same three riders a day earlier Brock had managed 12 points. Rounding out the scoring was the University of Guelph with five points. Kristina Kielty earned Guephs' top ribbon of the day with a third in novice flat. Guelph, which had scored 16 points during the opener, did not have a rider entered below the novice level (Eva Kasprzycka was second over fences on the 24th for Guelph's top ribbon of the weekend). 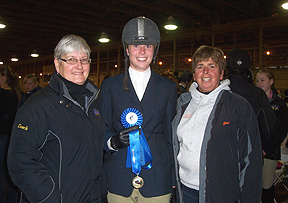 Red ribbons for Orange riders: Kristen Freiburger (on left) was second in open fences. Charlotte Kramer (on right) was second in open flat. Both ride for Syracuse University, which finished fifth overall for the day with 33 points. The Orange managed three blue ribbons as well. Is there a doctor in the house? : Five alumni riders took part at today's show, with Dr. Emily Weis winning both alumni divisions. Weis, who was Emily Unger when she graduated from Stonehill College in 1999, went undefeated for the weekend. Erika Riker, who still attends Nazareth College but has used up her eight semesters of eligibility, was second in alumni fences and fourth in alumni flat. 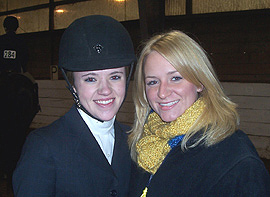 2008 Canisius College graduate Alyssa Polinger was second in alumni flat while placing fifth over fences. Polinger had earned red ribbons in both classes one day earlier. After having placed fourth in both divisions on the 24th, Polinger's former teammate and '08 Canisius graduate Christine Bigaj was third twice. Rounding out the placings was 2006 Virginia Intermont College graduate Stephanie Harnois. From the province of Quebec Harnois was fourth over fences and fifth on the flat. Harnois may have been the only Canadian rider on the 2004 and 2005 Virginia Intermont National Champion hunter seat teams. The Ride-Off: Held between the second and third sections of advanced walk-trot-canter, Cook, Kresge, Peachey and Basile competed in the ride-off. For the second day in a row Cook was the winner (though our caption with Cook's photo earlier in this story claims she won four blue ribbons, technically the ride-off ribbons bring that total to six - Editor). Basile was the Reserve champion. Spectacular work with electrical tape: Prior to Michelle Robinson's first in advanced walk-trot-canter the S.U.N.Y. - Potsdam freshman saw the zipperback break on one of her boots. With not all that much time to spare, members of the Potsdam team used electrical tape to hide the split. The reason we are mentioning it here is not because Robinson went on to win her class but because the taping job was so good that even up close one would likely think all was well with the boot. Perhaps the Potsdam riders could set up a concession stand for taping up split boots and earn some extra income! There were more than the usual number of riders showing today who coincidentally train at home with another IHSA Coach. Kali Knickerbocker of Nazareth College (center) trains at home in Pittsford with Gail Miller (on right), who is also the Head Coach at Rochester Institute of Technology. Knickerbocker placed second in intermediate fences and first in intermediate flat. After her first place performance Nazareth Head Coach Terese Bouchard joined Knickerbocker and Miller for a photo. A word for Empire Saddlery: Speaking of concessions the food concession was open throughout the show while the mobile unit for Emipire Saddlery was also on the Lehman Farms grounds for the duration. It is worth noting that Empire's ad in the show program stated that "For our valued intercollegiate customers 10% off any single regular priced item." Though there are some exclusions, the Empire ad concluded by saying this offer was "Good in the trailer at the show or at the shop!" and that the offer would not expire until 4/30/10. A Unique Program Cover: Speaking of the program S.U.N.Y. - Geneseo created one of the ten best IHSA Program Covers this writer has ever seen. The cover contained a crossword puzzle, with 'Crossword Puzzle Clues' on the second page of the program. 16 down for example was 'A specialist in equine hoof care (farrier) while 20 down was 'All the items of saddlery used for riding (tack). One catch: This writer could not find the answers written anywhere in the program. Hopefully the answers would be included in the next Region 2 show program. Cazenovia stays hot: Since October 25th Cazenovia has padded their lead. On November 14th and 15th the Wildcats earned two narrow victories, winning 42-39 over St. Lawrence in the former and 40-39 over Alfred in the latter (with St. Lawrence scoring 36). Then Cazenovia nearly went perfect at St. Lawrence on November 21st, winning 47-40 over the hosts. The Wildcats concluded the fall with a 47-36 win over Alfred at home, with Syracuse at 34 and St. Lawrence at 31. Though most seasons the Region 2 hunter seat team race usually goes down to the wire, Cazenovia sits in remarkably good shape to capture their first Region Title since 2007. While the Wildcats lead St. Lawrence by 42 and Alfred by 51, the Saints currently have the top hunter seat open rider. Through six fall shows Cook has an eight point lead over Liz Rotariu of Cazenovia and a nine point lead over three others. Cook has 56 of a possible 77 points, not bad for someone who rode intermediate flat on opening day. Show Incidentals: Partly cloudy skies, with temperatures in the mid 30's. Entire show held indoors. Start time: 9:14AM. Finish: 6:28PM - includes two schooling breaks totaling 75 minutes; No Coaches and Captians meeting held at today's show. Point cards posted in this region? Yes. Alumni Classes held in this region? Yes. Judge: Jean Salcedo. Stewards: Drueding/St. Lawrence University, Van Patten/Syracuse University and Sherrick - Von Schiller/Cazenovia College. Team Totals: Cazenovia College (High Point Team) 43; State University of New York at Potsdam (Reserve) 42; State University of New York at Geneseo 41; Alfred University 35; Syracuse University 33; St. Lawrence University 29; Ottawa University 23; University of Rochester 23; Nazareth College 23; State University of New York at Oswego 23; Canisius College 12; Rochester Institute of Technology 10; Brock University 9 and University of Guelph 5.